When President Ronald Reagan (1911–2004) made these Memorial Day remarks at Arlington National Cemetery on May 26, 1986, the world looked very different from how it had appeared to Calvin Coolidge 62 years before. The post-World War I dream of a world without war had been shattered by the horrors of World War II, though the nation mourned its dead as the heroes that they were. Over the next 40 years, a stalemated war in Korea, an unpopular and unsuccessful war in Vietnam, and understandable nervousness that the Cold War against the Soviet Union might turn hot and nuclear left the nation in a highly ambivalent mood about Memorial Day and why it should be celebrated. (In keeping with this altered mood, Congress in 1968 changed the traditional May 30th date of the Memorial Day to the last Monday in May, as part of the Uniform Monday Holiday Act, in order to transform public holidays into three-day weekends for American workers and families.) Reagan, speaking thematically about memory but in his disarmingly folksy style, tried to remind those present of why a national holiday of remembrance still matters. Why does Reagan say that “today is a day to be with the family and to remember”? How does he characterize what all his named heroes had in common? What does it mean to say “they loved with the sureness of the young”? How do you respond to his discussion of the sacrifices of youth? How does Reagan treat the veterans of Vietnam? How does Reagan’s speech about peace and strength compare with the speeches about peace made by President Coolidge (see above) or President Woodrow Wilson (see below)? 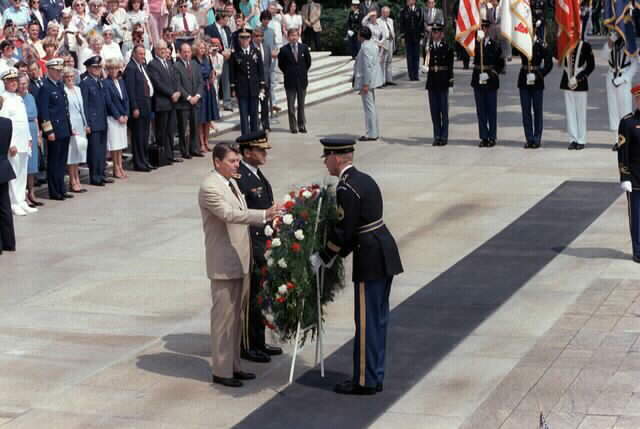 What exactly would Reagan have Americans remember on Memorial Day? 1 Here, Reagan remembers the astronauts who were killed commanding the Space Shuttle Challenger, which suffered catastrophic booster failure during the launch of its tenth mission in 1986. Gus Grissom (1926–67) and Roger Bruce Chaffee (1935–67) were NASA astronauts who died during a pre-launch test for the Apollo 1 mission in 1967. Return to text.